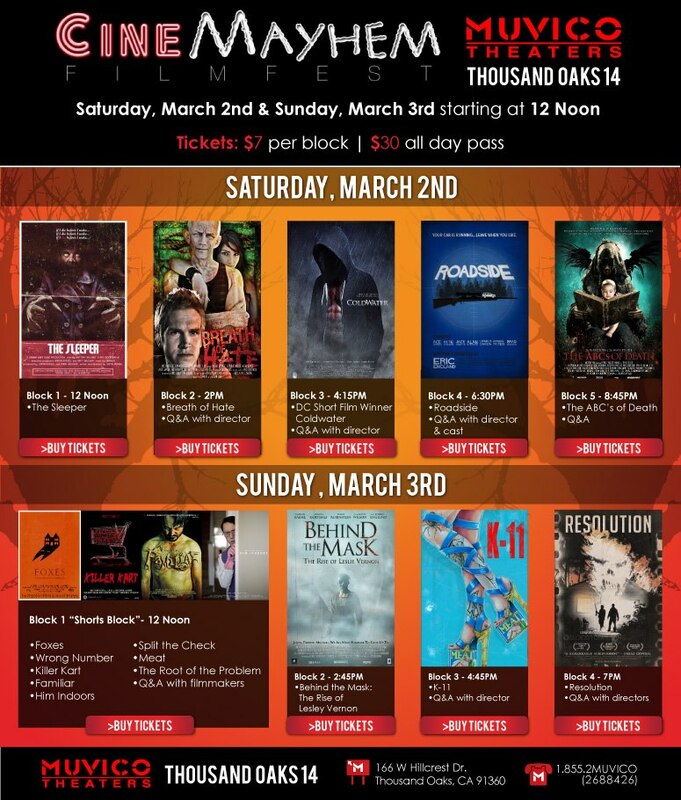 Founded this year as a launch event to kick-off Dread Central’s third annual Indie Horror Month this March by Heather Wixson, producer and horror journalist with DreadCentral.com, CineMayhem will celebrate the past, present and future of independent genre filmmaking at the Muvico Theaters in Thousand Oaks, California on March 2nd and 3rd. Created as a way to pay homage to and celebrate the spirit of independent filmmaking and those unafraid to take risks with their storytelling, CineMayhem’s diverse and often genre-bending line-up includes advanced screenings of two highly anticipated genre projects including Magnet Releasing’s visceral horror anthology THE ABC’s OF DEATH and Breaking Glass Pictures’ latest thriller K-11 directed by Jules Stewart (CRANK: HIGH VOLTAGE, MORTAL KOMBAT) as well as a retro screening of Scott Glosserman’s BEHIND THE MASK: THE RISE OF LESLIE VERNON. CineMayhem will also be hosting the World Premieres of ROADSIDE directed by Eric England (MADISON COUNTY) and the latest short film from Ryan Spindell (KIRKSDALE), THE ROOT OF THE PROBLEM as well as the West Coast Premieres of two other short films- Paul Davis’ (BEWARE THE MOON: REMEMBERING AN AMERICAN WEREWOLF IN LONDON) HIM INDOORS and SPLIT THE CHECK by Patrick Rea (NAILBITER). 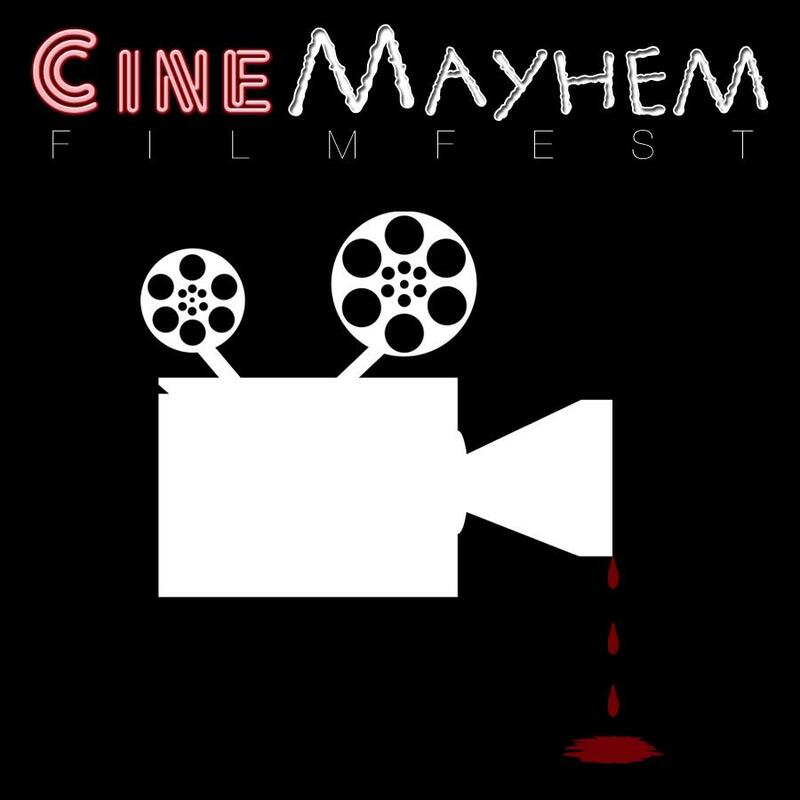 Other feature films currently selected for the CineMayhem Film Fest include BREATH OF HATE by Sean Cain (SILENT NIGHT, ZOMBIE NIGHT), COLDWATER by Dave Parker (THE HILLS RUN RED) and THE SLEEPER by Justin Russell. CineMayhem will also be screening several other award-winning short films including FAMILIAR by Zach Green, KILLER KART by James Feeney and FOXES by Lorcan Finnegan. CineMayhem Party to be Held Right After THE ABC’S OF DEATH at Bogart’s Bar & Grill inside the Muvico. All CineMayhem attendees may attend. Wrong Number (Patrick Rea): Two strangers connect, when a wrong number brings them together. Starring Cinnamon Schultz (Winter’s Bone) and Joicie Appell (Nailbiter). Written by Amber Rapp, Directed by Patrick Rea. West Coast Premiere- Him Indoors (Paul Davis): Gregory Brewster is a serial killer, only problem is, he’s agoraphobic! Facing an impending eviction from his family home, Gregory has a plan that will save him from being subjected to the one thing he’s terrified of… the outside world. Things don’t quite go to plan however, when a surprise visit from his new neighbor finds him in a very awkward situation. 4:45 PM- K-11 (Jules Stewart): Like Alice in a brutally violent Wonderland, music executive Ray Saxx, Jr. is trapped in K-11, a very unique part of the Los Angeles County Prison System. He was out cold when he arrived and he has no idea how he got there – all he knows is he needs to get the hell out…alive and intact. To do that Ray must navigate through a maze of drug addled-transvestite- criminal politics with obstacles at every turn. Insane cellmates, corrupt guards and his own issues are just a few of what he’s dealing with while he pieces together his means of release from this dark and dangerous rabbit hole – K-11. Official sponsors for the 2013 CineMayhem Film Fest include Muvico Theaters (www.muvico.com/Thousand-Oaks-14), Sideshow Collectibles (www.sideshowtoy.com), Magnet Releasing (www.magnetreleasing.com), Scream Factory (www.shoutfactory.com/?q=screamfactory), Dread Central (www.dreadcentral.com) and Breaking Glass Pictures (www.breakingglasspictures.com). To keep up with all the CineMayhem to come this March, fans can follow us on Twitter at twitter.com/CineMayhem or on Facebook at http://www.facebook.com/CineMayhemFilmFestival.